The last quarter of the twentieth century was marked by two dramatic political trends that altered many of the world’s regimes: the global resurgence of democracy and the collapse of communism. 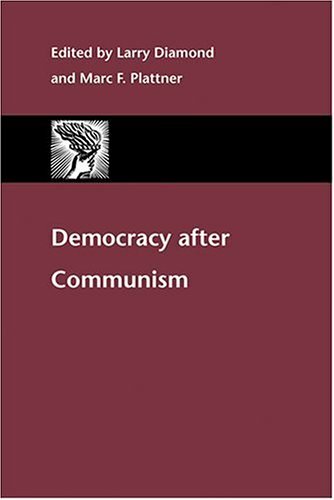 Was the process that brought down communism in Eastern Europe and the former Soviet Union fundamentally different from the process that gave birth to new democracies in other regions of the world? Were the transitions away from communism mostly like or mostly unlike the transitions away from authoritarianism that took place elsewhere? Anders Åslund, Carnegie Endowment for International Peace in Washington, D.C.; Leszek Balcerowicz, Warsaw School of Economics; Archie Brown, Oxford University and St. Antony’s College; Zbigniew Brzezinski, Johns Hopkins University, a former U.S. national security advisor; Valerie Bunce, Cornell University; Nadia Diuk, National Endowment for Democracy in Washington, D.C.; M. Steven Fish, University of California–Berkeley; Charles H. Fairbanks Jr., the Johns Hopkins University; Bronislaw Geremek, former foreign minister of Poland; John Higley, University of Texas at Austin; Judith Kullberg, University of Michigan–Ann Arbor; Mart Laar, prime minister of Estonia; Michael McFaul, Stanford University; Ghia Nodia, Tbilisi State University; Jan Pakulski, University of Tasmania in Australia; Richard Rose, University of Strathclyde in Glasgow; Jacques Rupnik, College of Europe in Bruges; Lilia Shevtsova, Carnegie Endowment for International Peace in Washington, D.C.; Aleksander Smolar, Stefan Batory Foundation in Warsaw and Centre National de la Recherche Scientifique in Paris; G.M. Tamás formerly of Georgetown University; Vladimir Tismaneanu, University of Maryland at College Park; Grigory Yavlinsky, member of the Russian State Duma (parliament). Larry Diamond is a senior fellow in the Hoover Institution at Stanford University and co-editor of the Journal of Democracy. Marc F. Plattner is editor of the Journal of Democracy at the National Endowment for Democracy.